The crowds are long gone from California's Mojave Airport and Burt Rutan's team is back at work on a new flying machine. Like SpaceShipOne, the homebuilt rocketship that claimed a £5.2m cash prize for twice reaching suborbital space, Rutan's next creation will travel beyond Earth's atmosphere as well. SpaceShipTwo (SS2), however, will have more than a single occupant. Rutan is toying with designs to accommodate up to eight passengers at a time, with enough upgrades to warrant a ticket in the £104,000 ($200,000) price range. "I think anyone who had the chance to go would want to go," said Trevor Beattie, a British advertising personality, who already has booked a flight. Rutan, who has been averaging better than one new aircraft design every year for the past three decades, says he is finished with airplanes for a while. The mission now for his Mojave-based company, Scaled Composites, is to create 3,000 new astronauts a year - per departure point, Rutan adds, and per ship. "Mojave is not going to be the only place in the world where there will be a place to buy tickets and fly a spaceflight," Rutan said. 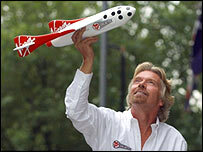 The partnership that built SpaceShipOne, Mojave Aerospace Ventures, has its first paying customer: Sir Richard Branson. The British tycoon and flamboyant chief of the Virgin Group in London has ordered a fleet of spaceliners to carry passengers beyond the atmosphere. The backbone of the Branson venture, called Virgin Galactic, will be five vehicles based on SS2. Each will be capable of flying at least five and more likely around eight people at one time. SpaceShipTwo will not look anything like its predecessor. For one thing, Rutan must fix a stability problem caused by SpaceShipOne's high upswept wings. For another, Rutan and Branson plan a ship of luxury, with service and amenities that at least match Virgin Atlantic's upper-class travel service. And that, as any airline flier knows, starts with leg room. Seats will fully recline so that even elderly passengers - Rutan and Branson both plan to fly their elderly fathers - will be able to handle the expected force of six times Earth's gravity upon descent. The G-forces are higher than what SpaceShipOne's pilot experienced, but that is because Rutan is aiming for a top altitude of between 84 and 87 miles (135-140 km), rather than the 62-mile (100km) target required to win the Ansari X-Prize competition. 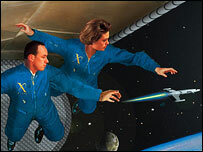 The extra altitude will add about another 90 seconds of "weightlessness" for passengers to enjoy. Travellers will be able to do more than watch how candy flies around in space - they can fly themselves. "Instead of shoulder harnesses and tight seatbelts we want this roller coaster-type bar that you fold out of the way and you can float around," Rutan said. "We think that's important. If you want the view, we have handles there so you can float over and put your nose right against your own window. "Or if you want to pull down your science tray and do whatever you brought along for an experiment, or play with your cat - you have bought the ride, you paid for it. "This experience is going to have very few restrictions on what you can do because these payloads are doing it for fun and every person has a different idea of what fun is. "Does that mean that some guy and his girl might want to take the whole ship? OK!" In exchange for some of the extra altitude and about 30 seconds of weightlessness, passengers also may have the option of landing in a different place from where they took off. 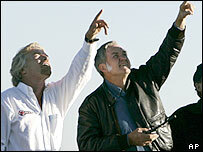 "The ship could launch not far from Las Vegas and land in Mojave," Rutan said. "Or, we could launch offshore, start out over the ocean and then... fly over the mountains and land in the desert. "I think that will add something to the experience." Initially, the cost of the flights will be too high for most people to afford. 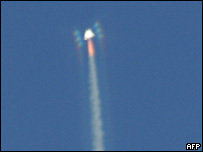 However, within 10 to 12 years, suborbital spaceflight would be a real option, Rutan said. The best part of all, Rutan added, was that 15 years from now, "every kid who dreams, 'Wouldn't it be cool to fly in space?' will know that in your lifetime, you are going to go to orbit. "You will know that, not just dream that. That is the neatest thing about the whole programme."